Sometimes, when I'm on the bliss Facebook page, Facebook make recommendations for similar pages. Frankly these are mostly pretty inaccurate, but one day a suggestion to view the BatchPhoto page popped up. 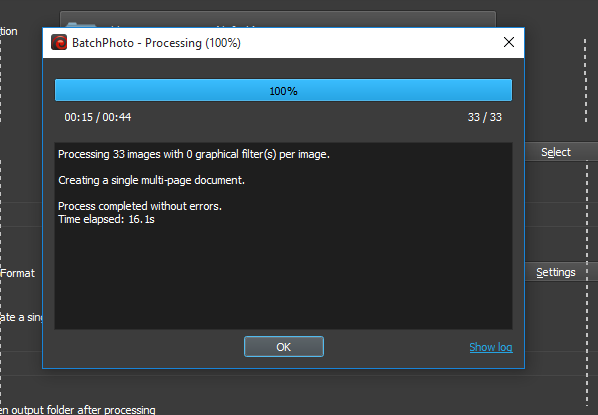 Reviewing it, and the BatchPhoto website, gave the impression the tool would have similar users to bliss. So I posted about it. Fast forward a year or so and I got in touch with Mike, who writes the software. I suggested using BatchPhoto to generate a PDF catalogue of album art, as suggested in our ideas forum. 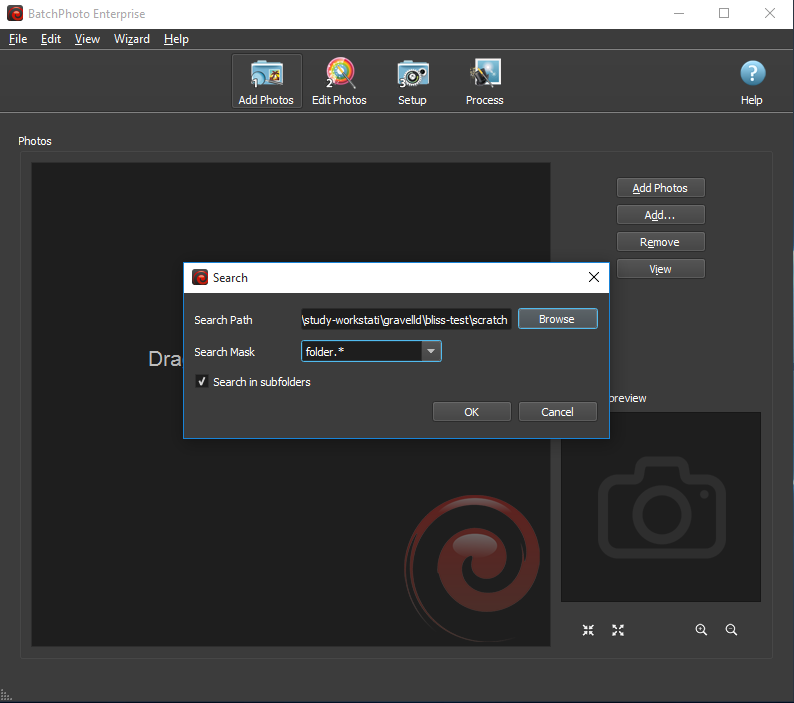 BatchPhoto has additional image processing functions that go way beyond what bliss offers. So here follows an example workflow of using the two tools together. 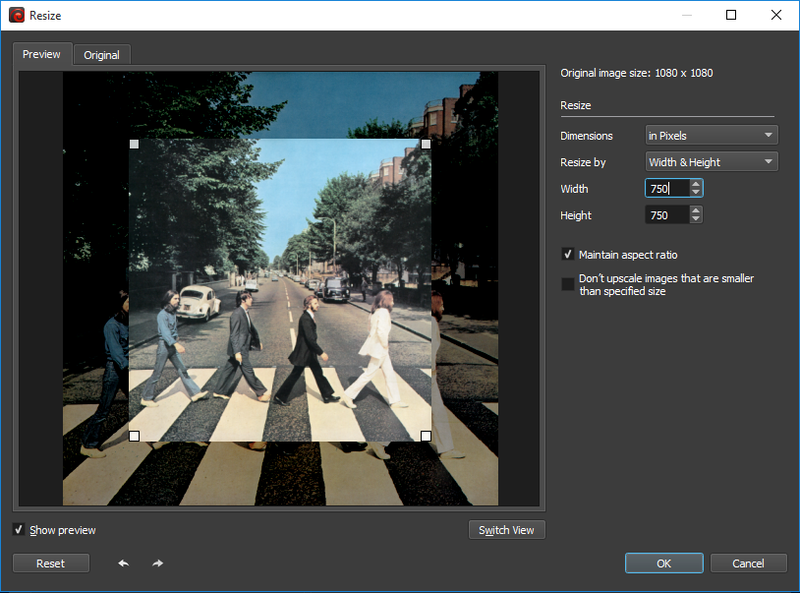 Given BatchPhoto only works on image files (not embedded art), let's start by using bliss to fill in missing images, and making sure they hit a decent minimum resolution threshold, then we'll do our post-processing in BatchPhoto. 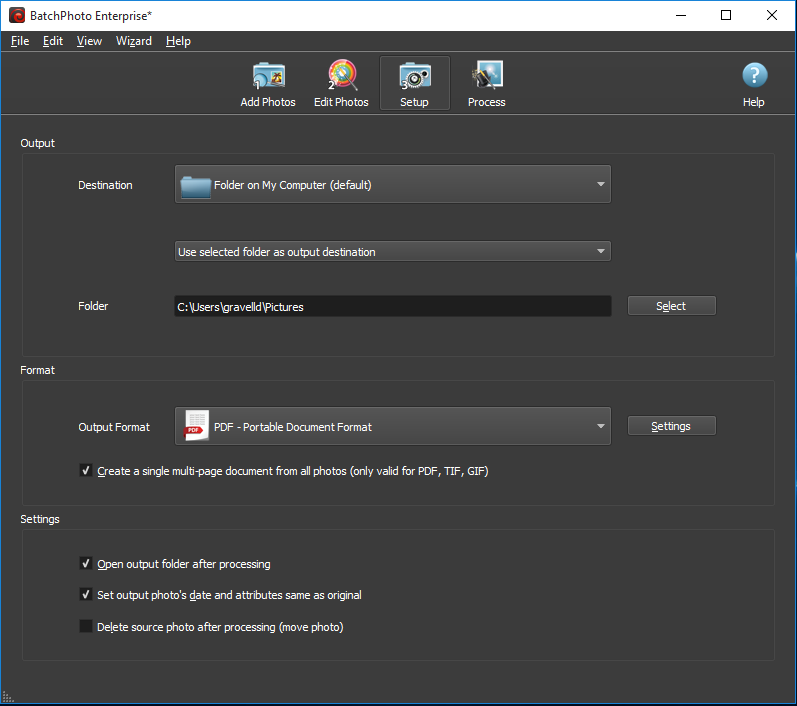 Although we're generating a PDF here, we could also perform any of BatchPhoto's image processing functions, subsequently embedding them in the files too. Like BatchPhoto, bliss is available for both Windows and macOS. This walkthrough will show screenshots for Windows, but it should work fine in macOS too. 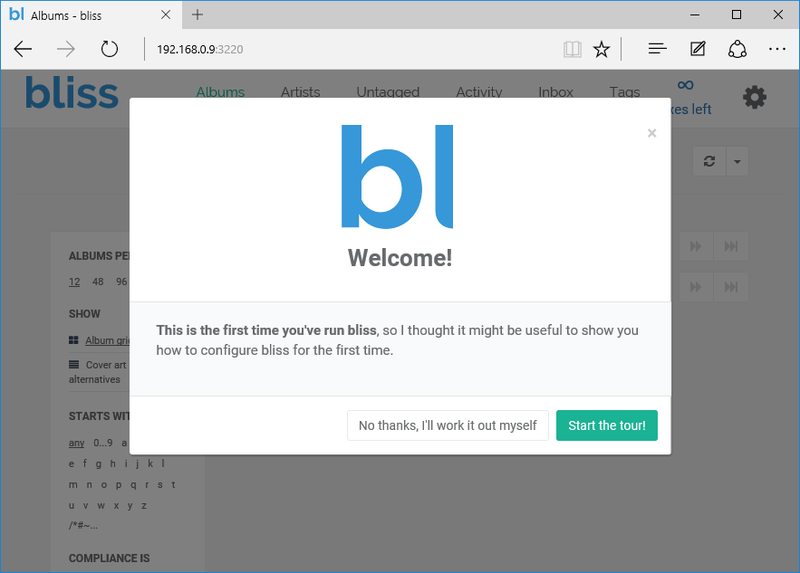 Download bliss from our download page and run the installer to install it on your computer. Run it; bliss runs as a background process and should load into the System Tray (Windows) or the Menu bar (macOS). The first time you run it, it will open a browser window. Let's enable the cover art rule. Under Cover art click the ON/OFF button to enable cover art. Check the settings are as you'd like them; in some cases you might want to specify minimum or maximum resolutions, for example, but we can also use BatchPhoto for that! I think we should set a minimum resolution threshold, to make sure our resulting PDF looks good. I'll set it to 500x500. 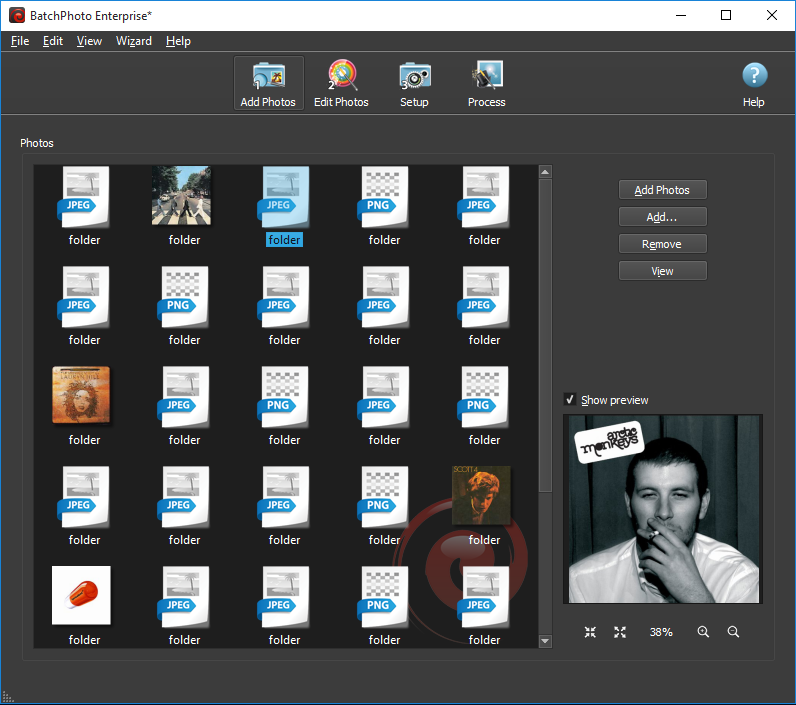 Once the cover art rule is enabled, bliss will check your albums have album art and, if it's missing, automatically fetch it and install it to an image file with the name you specified. Click Apply rules and bliss will begin scanning your music library. You can change the album art either via the album page, or the Cover art alternatives link. As a reminder, we want to generate a PDF catalog of all of our album art. Along the way we'll also use BatchPhoto's smart resizing filter to make sure the artwork is all presented at the same size. It's pretty simple to install BatchPhoto; download it from the BatchPhoto home page. Sweet! 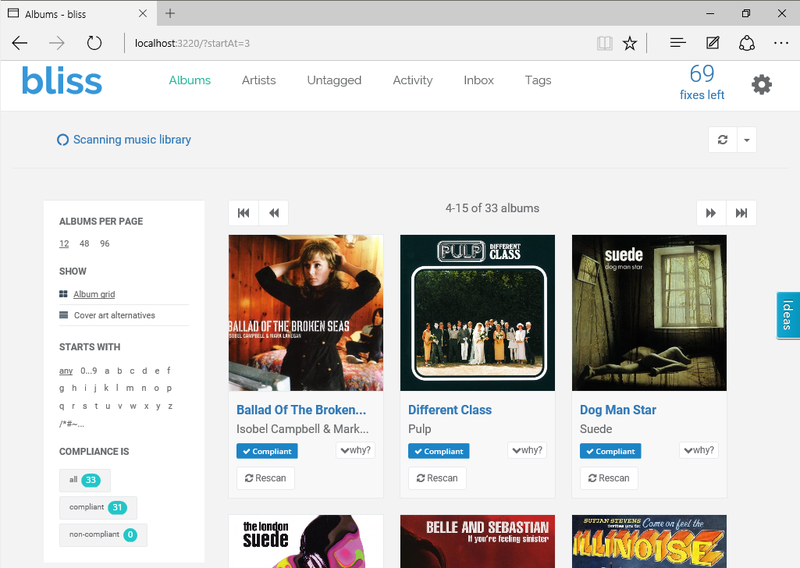 I hope this helps give a good introduction as to how bliss can be used to find album art images, and BatchPhoto can be used to process them!